This cute little cottage is beautifully situated in a lovely seaside community, and we loved the quick access to the park and the soothing sound of the waves. The interior space is rather awkward. We thought it was odd that we were directed not to move furnishings, but it became immediately evident upon entering why they are having issues with this; there is no comfortable are for four people to lounge or watch television together. Management should consider spending a night or two to get a better sense of what a guest needs. P.S. More pillows, please. 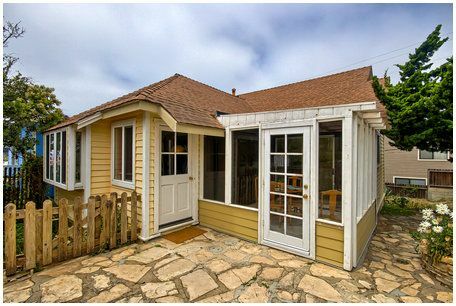 This charming little home is very well located on a quiet street a short walk from Shamel Park and the ocean, with easy walking access to Moonstone Beach in one direction and Fiscalini Ranch Preserve in the other. It was cozy, clean and had everything we needed for a long weekend stay. Breakfast in the sunroom was a highlight. We wouldn&#x2019;t hesitate to stay here again. Overall it was ok. Lights in the the bedroom didn&#x2019;t work, the refrigerator leaked water, the floors were dirty, a bunch of cobwebs in the entryway of the front door (outside of the door) the landscape was very dry, we saw pieces of trash in the yard and flower bed area, may be due to raccoons at night. The home was located in nice neighborhood, there was great a great cross breeze when all the windows were opened, everything else was satisfactory. But for the price I was expecting expecting a bit better, I guess your paying for the location. Property was very clean and cute. Rental had the bare minimum of spices-had to buy a few to get by. Bathroom was fine. Bed in master bedroom is old and very low to ground-should be upgraded. Decent rental but not the best Scenic has to offer. It felt great to escape to such a beautiful area of California. The house was close to the beach, although I would have loved a view, and close to town, which made it very convenient.